Are you always on your computer? Are you constantly checking your Android smartphone or tablet in between moments of productivity? What if I told you there was a better way? 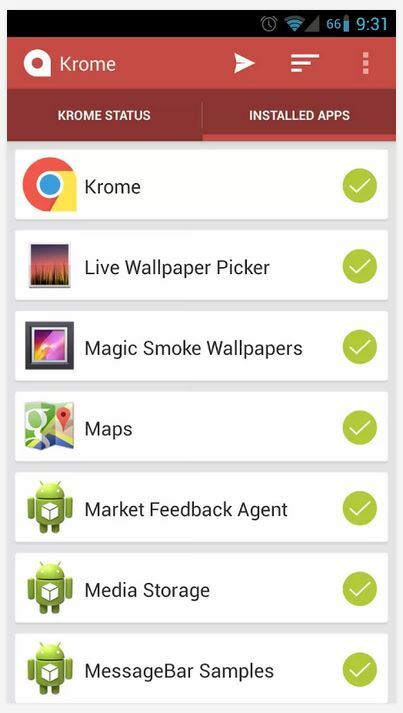 Krome is a unique application for Android that works hand-in-hand with the Google Chrome browser. 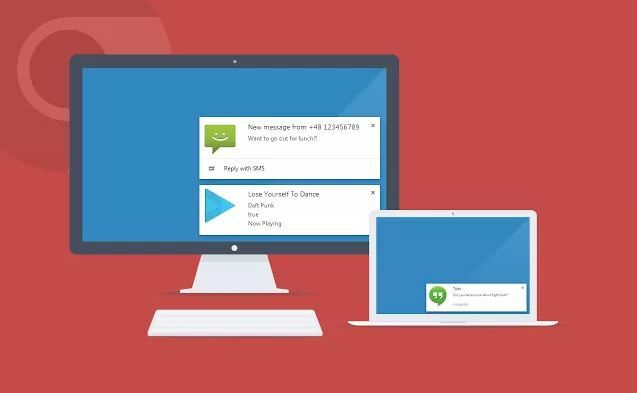 It allows you to receive Android notifications right on your desktop, through the very same push notifications that Chrome delivers. You may not know this, but a recent version of Chrome (Chrome 28) added support for card based notifications. 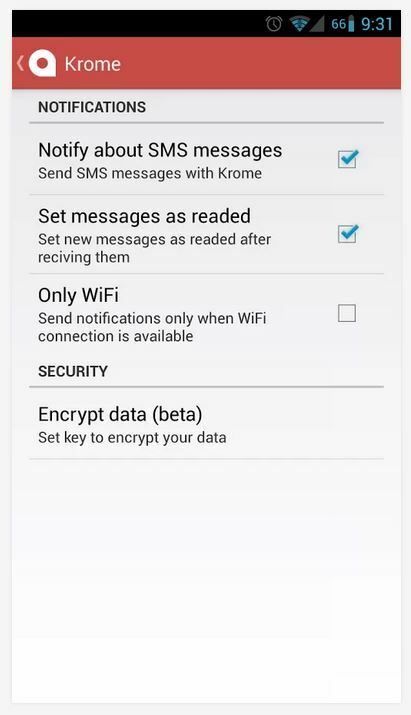 Those are the same notifications that work with Krome. 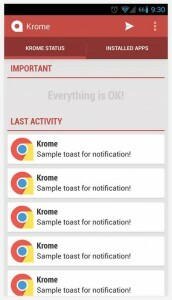 Krome is an Android application that is designed to push your notifications to Chrome 28 through card based pop-ups. The idea is to allow you to focus more on your work or other tasks, without the need to check your phone every so often. Any and all notifications can be delivered through the new Chrome notification system. The browser extension is free, but the Android app costs $0.99 and there is no ad-supported version available. You’ll have to purchase the app if you’d like to use it. Why is this application appealing and who is it for? Well, personally I’m always on one of my computers and I use Chrome as my main web browser of choice. That being said, it may seem pretty lazy but it gets annoying checking your phone or tablet every few minutes for notifications. Just following through the act tends to kill a bit of my productivity. There are apps that allow you to text through your phone, from your browser. There aren’t many that allow you to see any and all notifications on your desktop, though. That being said, I would recommend this app for anyone that tries to juggle using multiple devices mobile included. So, how does it work? You need to install two components, one on your mobile device and the other an extension for your browser. 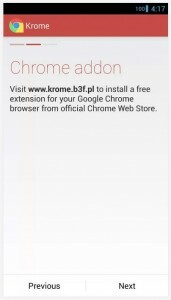 More specifically, you need to install the Krome extension for the Chrome browser. 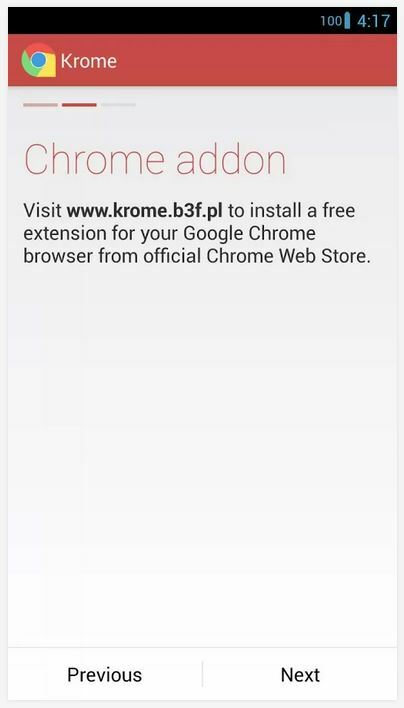 Krome for Chrome, that sounds a bit funny, I know. Obviously, you also have to install the Android app on your device. 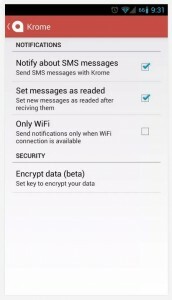 On first run Krome takes you through a short setup process that allows you to enable or disable various notifications to be sent through your browser. For example, you’d definitely want to see notifications from a texting app but not those from Google Play alerting you that an app was just updated- seems a bit redundant. Anyway, the next step after setup is pairing your device with your browser extension. The app will provide you with a serial code which works almost exactly like an API key. Next, we have to enable some settings from an advanced menu in Chrome. Open the Chrome flags menu by typing “Chrome://flags” into your navigation bar. 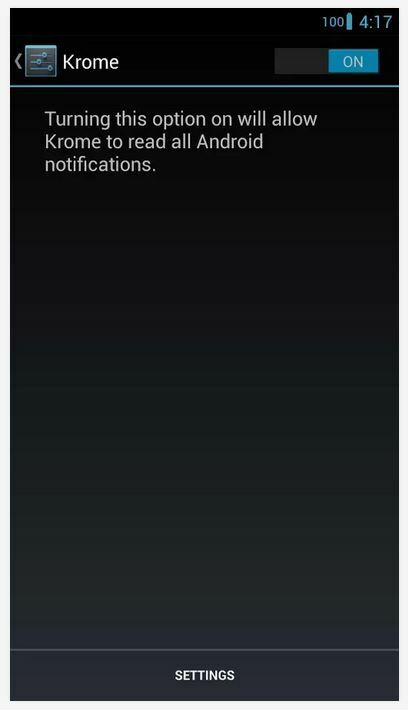 Scroll down the list of options and make sure rich notifications, sync notifications and Google Now are all enabled. If these options are not enabled then the notifications will not show up. With text message notifications, you can reply right from your browser. That makes this app extremely useful if you don’t have a remote messaging app installed like MightyText. Even more of a blessing, you can set the app to label messages as read on your phone if you respond from a browser. This saves you the hassle of dismissing all previous text notifications that you’ve already read. On the mobile app, the homescreen will display some of the most recent notifications sent to your browser. It’s hardly necessary, but it does allow you to track notifications that you might have missed. 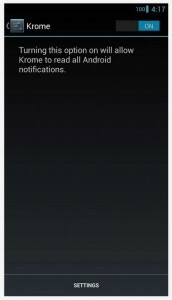 You can also navigate to an “installed apps” tab which lets you enable or disable push notifications for various apps. For example, don’t want those Facebook app notifications to show in your browser, no problem! You can even use a “Block Overflow” function to keep Krome from sending too many notifications from a specific app in a short period of time. Believe me when I say that it’s a boon for some situations, like when someone is spamming your Facebook wall. You don’t have to worry about your notifications and sensitive information falling into the wrong hands, because the data can be encrypted for added security. Generally, notifications are sent as plain text accompanied by HTML code but you can generate a random encryption key if you’re feeling particularly vulnerable. The key makes it so that the data can only be processed and read by the mobile app and resulting browsers. I had absolutely no issues receiving notifications in my browser on both my laptop and desktop PCs. However, there are plenty of reviews in Google Play noting issues. Perhaps they did not enable the necessary Chrome flags? It could always be a bug or issue with the app and extension though, so it’s worth noting. 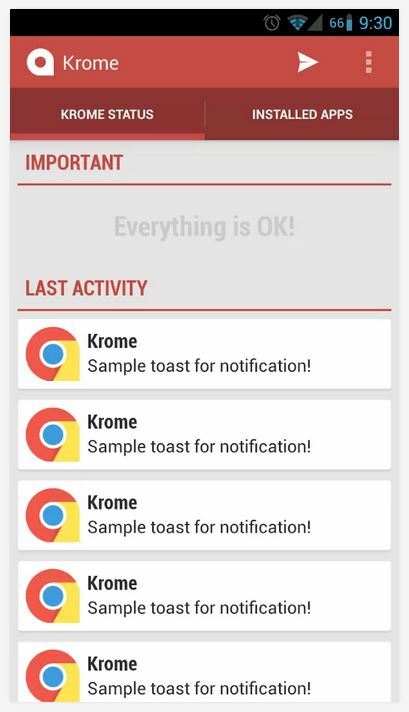 Krome for Android and its accompanying Chrome browser extension allow you to receive your push notifications right on your PC. Text message notifications allow you to reply right from your browser, and you can control what shows up. Essentially, the mobile app allows you to configure what applications push notifications to your browser and it also allows you to stem the flow if necessary. It will require some finagling to get the system setup properly, namely you have to enable several Chrome browser flags. That being said, setup is not difficult at all and it works great- at least in my case it did. You can encrypt all data with a randomly generated key if you want to protect yourself, and you can also dismiss notifications that have been read from your browser (no pesky doubles on your phone). If you’re always on your computer and constantly stopping your work to check your phone, this app combo is a no-brainer!